Hezekiah Cooley Hall was the son of Luke Hall, Jr. and Ruby (née Pease) Hall. He was born 9 May 1810 in Smyrna, Chenango, New York, two years after the birth of his brother Daniel Spencer Hall (b. February 1808). His surviving siblings at the time were Luke Hall [III], Ruby Hall, Fanny Hall, and Flora Hall. Hezekiah married Lydia Almira York 5 November 1852 in Brookfield, Madison Co., New York. He died 16 February 1872. They had three children. 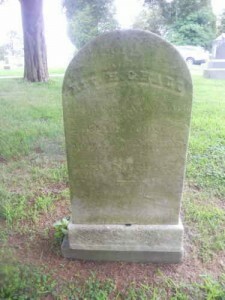 He is buried in Cedar Green Cemetery in Clayton, Gloucester, New Jersey. The back of his gravestone reads Rev. H.C. Hall. Hezekiah’s wife, Lydia Almira (York) Hall, b. 29 March 1822, was the daughter of Ichabod and Freelove (Gardner) York. Lydia graduated from Cazenovia Seminary in 1848 and was a teacher at Brookfield Academy. She was Preceptress of Onondaga Academy at Manlius, New York and Preceptress at Silver Creek Academy, Silver Creek, New York and later Superintendent of the Mission Schools among the Onondaga Indians of the Onondaga Reservation. Lydia died 26 September 1892. Rev. Hezekiah C. Hall was the son of Luke and Ruby (Pease) Hall. He was the husband of Lydia Almira (York) Hall. He was a minister in the Oneida Conference and Central New York Conference of the Methodist Episcopal Church. [See notes below. KH] He served in the ministry for 28 years. 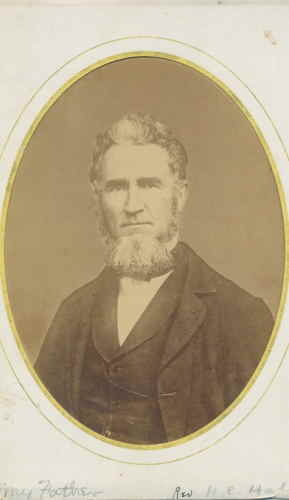 HALL.–Hezekiah C. Hall of the Central New York Conference, died in New Jersey, February 16th, 1872. Bro. Hall was born in Smyrna, New York in 181O. At the age of twenty-four he gave his heart to God and joined the Methodist Episcopal Church. His love to God and souls was such, and feeling called to the ministry, he joined the Oneida Conference in 1844, and was stationed at East Homer. After nine years of labor, his health was such that he took a superannuated relation for four years. His health improving he took a charge, and was in the effective ranks for nine years more. His last charge was at DeRuyter and Sheds Corners. After laboring here for about six months his health entirely failed. His sufferings were severe for months when he recovered so as to be about the house. He had been afflicted with sciatic rheumatism for years, which at times caused intense pain, but such was his love for the work, and his ambition to do what he could, that on one charge he was obliged for weeks to go on his crutches to the church, and then sit down to preach. About five years ago, hoping a change of climate might help him, he removed with his family to New Jersey, a few miles north of Vineland. But he only partially recovered, and to add to his sufferings he was thrown from a wagon, dislocating his hip, which not being properly set, caused him increased pain. When I visited him last fall, I found him able to walk about some, but only the wreck of his once strong and manly form. But his faith in God was strong, and he was looking for the time when his sufferings would end, and he be at rest. He retained his reason till the last, and died in the full hope of a blissful immortality. “Our people die well,” and the Gospel which he preached, now sustained him. His funeral was attended at the Methodist Episcopal Church in Clayton, and he was buried there. He leaves a wife who for nearly twenty years has shared with him the joys and trials of life, and three children. Distinguished alumni include Jesse Truesdell Peck, a founder and first president of the board of trustees at Syracuse University; Charles Dudley Warner, editor of the Hartford Courant and close friend of Mark Twain; and Leland Stanford, who founded and endowed Stanford University of California, served as a United States senator and governor of California, and was president of the Central Pacific Railroad. When America’s first transcontinental railroad was completed, it was Stanford who drove the golden spike where the two rail sections joined in Utah.